Gréisst vun dëser Duerstellung: 574 × 600 Pixel. Aner Opléisungen: 230 × 240 Pixel | 459 × 480 Pixel | 735 × 768 Pixel | 980 × 1.024 Pixel | 3.714 × 3.880 Pixel. 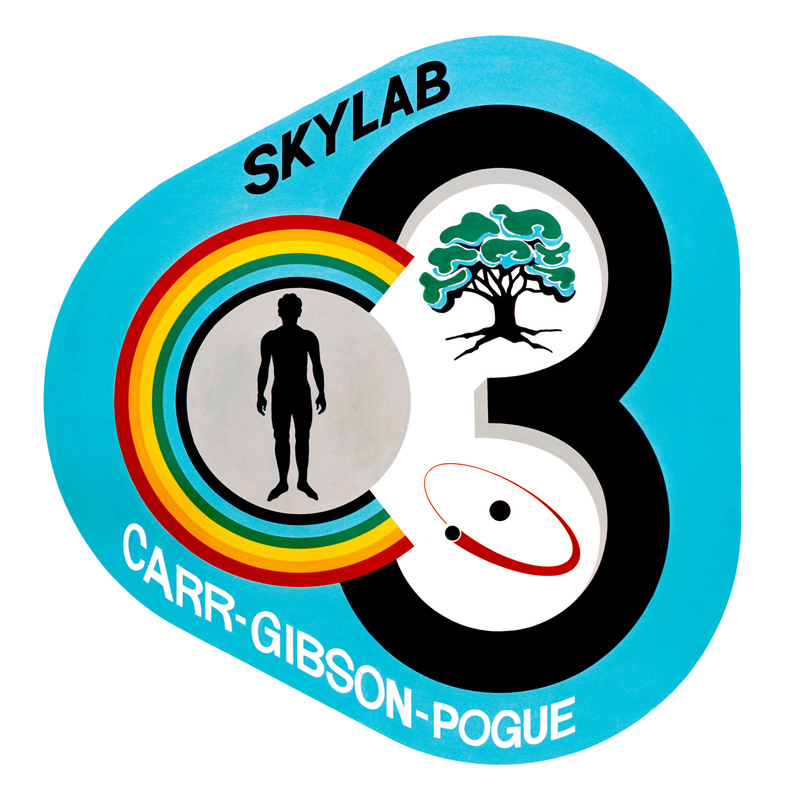 English: This is the emblem for the third manned Skylab mission. It will be a mission of up to 56 days. Skylab is an experimental space station consisting of a 100-ton laboratory complex in which medical, scientific and technological experiments will be performed in Earth orbit. The members of the crew will be astronaut Gerald P. Carr, commander; scientist-astronaut Edward G. Gibson, science pilot; and astronaut William R. Pogue, pilot. The symbols in the patch refer to the three major areas of investigation proposed in the mission. The tree represents man's natural environment and relates directly to the Skylab mission objectives of advancing the study of Earth resources. The hydrogen atom, as the basic building block of the universe, represents man's exploration of the physical world, his application of knowledge, and his development of technology. Since the sun is composed primarily of hydrogen, it is appropriate that the symbol refers to the solar physics mission objectives. The human silhouette represents mankind and the human capacity to direct technology with a wisdom tempered by regard for his natural environment. It also directly relates to the Skylab medical studies of man himself. The rainbow, adopted from the Biblical story of the flood, symbolizes the promise that is offered man. It embraces man and extends to the tree and the hydrogen atom emphasizing man's pivotal role in the conciliation of technology with nature. Diese Mediendatei wurde vom Johnson Space Center der US-amerikanischen National Aeronautics and Space Administration (NASA) unter der Datei-ID S72-53094 kategorisiert.